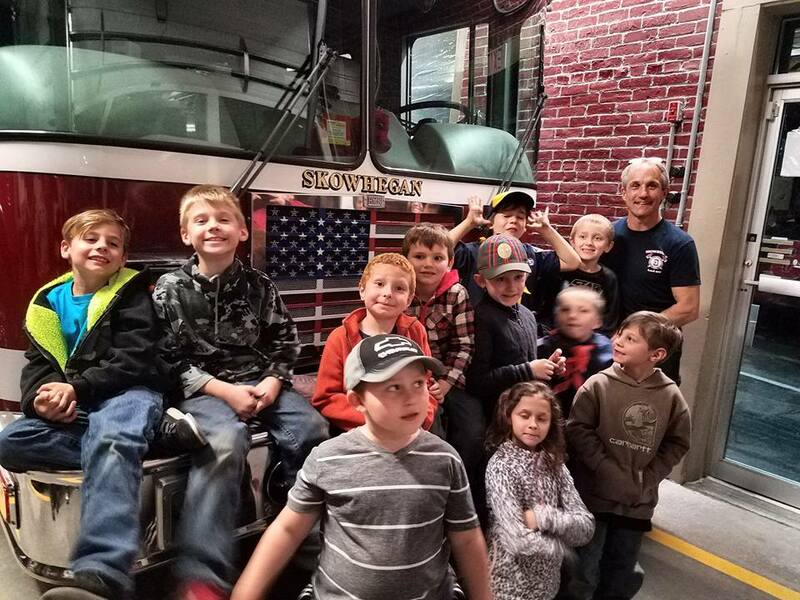 Cub Scout Pack #482, in the Anson/Madison area, has been selected to do a sleepover at the Boston Children’s Museum at the beginning of April vacation. They are presently raising money by having bottle drives, as well as other fundraising efforts, including a GoFundMe page. All money raised will go towards chartering a bus that will bring the 12 scouts and their 13 family members to Boston for a trip they will never forget. 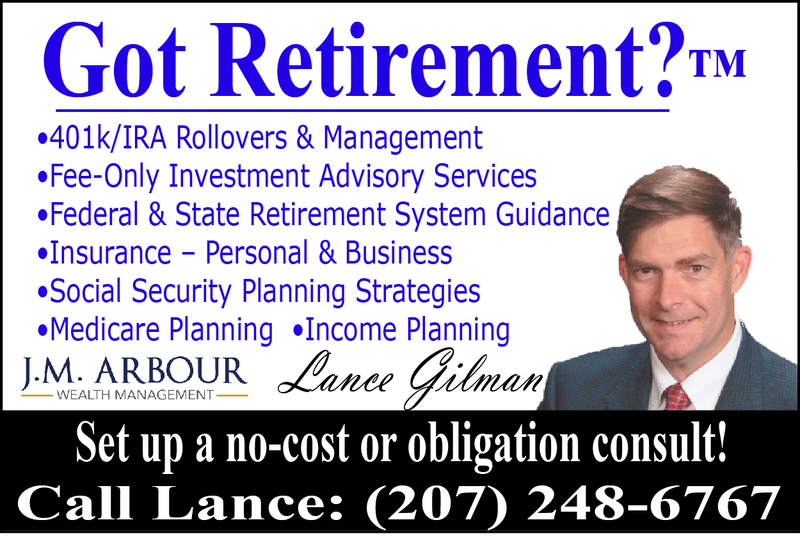 Donations may be made by contacting Christina Nelson, at 207-431-1177. Many of the families going on could use the financial assistance. U.S. 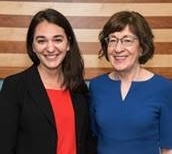 Senator Susan Collins announced that Kristin Bishop, a Madison native, has been hired as a staff assistant in her Washington, D.C., office. Kristin recently completed her fall internship in Senator Collins’ D.C. office and also served as a summer intern in her D.C. and Augusta offices. Kristin is the daughter of Frank and Vanessa Bishop of Madison. Kristin graduated Phi Beta Kappa from Bowdoin College in May 2018 with a degree in Government & Legal Studies and Education. While in college, Kristin was an active leader in community service organizations focusing on education and public service. As a staff assistant, Kristin will be assisting with front office duties and fielding constituent requests. The Madison American Legion Auxiliary, Unit #39 supports community programs such as children and youth. 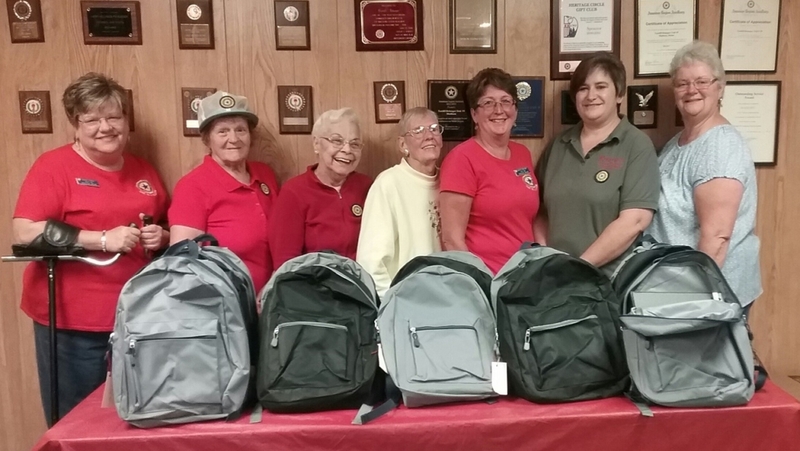 Each year the members of the auxiliary donate school backpacks filled with school supplies and distributes them to four local schools in Madison and Anson area. This year they donated a total of 20 school backpacks. American Legion Auxiliary members have dedicated themselves for nearly a century to meeting the needs of our nation’s veterans, military and their families both here and abroad. They volunteer millions of hours yearly, with a value of nearly $2 billion. As part of the world’s largest women’s patriotic service organization, auxiliary volunteers across the country also step up to honor veterans and military through annual scholarships and with ALA Girls State programs, teaching high school juniors to be leaders grounded in patriotism and Americanism. To learn more about the auxiliary’s mission or to volunteer, donate or join, visit www.ALAforVeterans.org or contact: Robin Turek, president – American Legion Auxiliary Tardiff-Belanger Unit #39, PO Box 325, Madison, ME – robinturek@gmail.com – 696-8289. Springfield College, in Springfield, Massachusetts, named the following local students to the dean’s list for academic excellence for the spring 2018 term. Christopher Hayden, of Madison, studying applied exercise science. The Solon Budget Committee meeting was held at the Municipal building on Saturday, January 20, with the following in attendance: Ann Padham, Bruce Hills, Frank Ridley, Barbara Johnstone, Eleanor Pooler, Carol White, Donald Kenerson, George Williams, Albert Starbird, Allen Foss, Joseph Albuit, Jeff Pomelow, Lois Miller and Gaye Erskin . Selectmen, Elaine Aloes, Mary Lou Ridley and Sarah Davis; Treasurer, Sharon Begin; Town Clerk/Tax Collector, Leslie Giroux, Road Commissioner, Mike Foster, Fire Chief, Duayne Rollins. Others there were Keith Galleger, who is running for the selectman position in March and Lief and I. A meeting of the Coolidge Library Trustees meeting was held at the library on January 18 with the following in attendance: Librarian, Megan Myers, Richard Roberts, Mary Farrar, Jane Ouderkirk, Allen Foss, Lief Bull, and Diane Trussell. Megan passed out copies of her report and answered questions. The School Bookmark Contest continues to be popular. The winning submission is chosen from each class (Pre K-5) at Solon Elementary School. Megan was this year’s judge, along with the district art teacher. The annual Summer Reading Program ran June 29 – August 10. This year’s activities were assisted by a local teen volunteer. During the program, Build a Better World, she focused on books and activities that promoted science, engineering, arts and community awareness. There was a small but consistent attendance. Meals were again available to all children and teens from the school’s Summer Meals Program. Was pleased to receive an e-mail from Ferra Kelley about the following information: Once again, volunteer members of AARP will be preparing & filing Federal/State tax returns, free of charge, to senior and low income families in the area. The Crossroads Bible Church, 705 White School House Rd. Madison have again generously allowed us to work out of their premises, and we are taking appointments for Friday & Saturday mornings, beginning in February. Please do not make calls to the church directly, as they are not otherwise involved in the program. 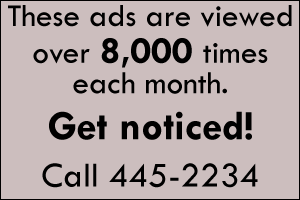 Call Ferra @ 643-2559 to schedule an appointment. That means so much as we go our way. From weary shoulders on the road. Or a gentle word, like summer rain. May soothe some heart and banish pain. This is from one of those little Salesian Inspirational Books, that I have collected for many years. A Quarter Auction will be held on Saturday, September 30, 9 a.m. to 2 p.m., at Madison American Legion Hall, 20 S. Maple Street. Check out this exciting fundraiser that has never been done in this area before! Quarter Auction is a combination of an Auction, Vendor Fair and Luck of the Draw all rolled into a fun time. 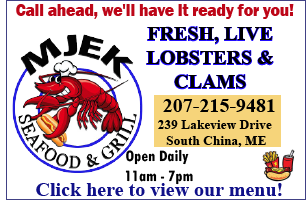 Doors open at 9 a.m. Auction starts at 10 a.m. Admission is $2 per Auction Paddle. The kitchen will be open. 50/50 Raffle and various other raffles. Bring your quarters! Quarters will be available to purchase. All proceeds to benefit veterans programs and local community charities. For more information, call Harriet 635-2051, Fran 696-3726 or Bonnie 772-418-4534, also as an event on Facebook entitled Quarter Auction. Event sponsored by the American Legion Auxiliary, Unit #39-Madison. 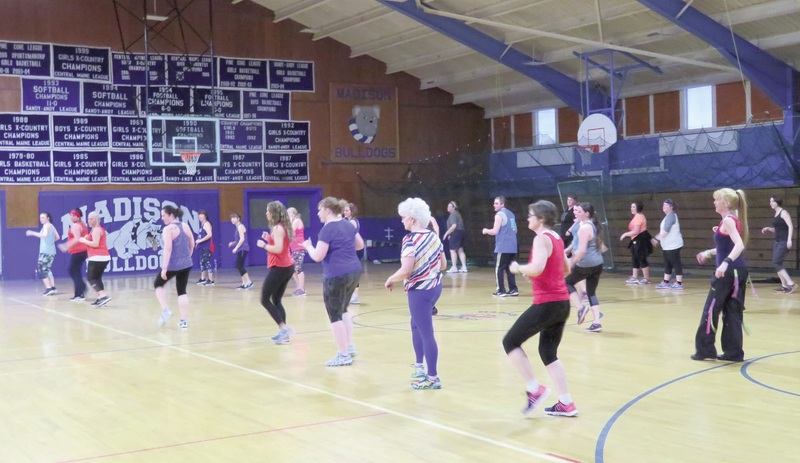 The Zumba-Thon for Veterans was held on April 21 at Madison Junior High School to benefit the programs for veterans at Togus. More than $1,100 was raised which will be donated to the programs such as the VA/VS which includes keeping the supply closet of comfort items for every veteran who is admitted, coffee and newspapers in the waiting room, gifts at Christmas and other activities. Below, the nine instructors who conducted the zumba-thon, from left to right, Christine Marie, Hillary White, Lisa Berry, Allison Marcoux, Tiara Nile, organizer, Lisa Doyon, Denise Delorie and Suzanne Lamb. The University of Rhode Island, in Kingston, Rhode Island, has announced the Fall 2016 dean’s list. The following students were named to the dean’s list with their area of study: Alexandria M. Jarvais, of Madison, majoring in Pharm D, and Rachel Cambridge Pratt, of Cornville, majoring in Kinesiology. 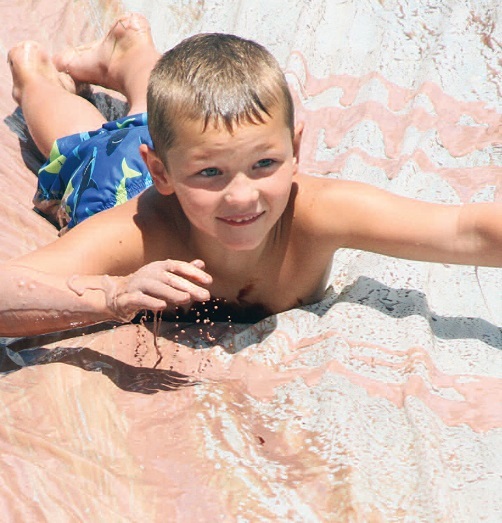 Left photo, Mathis Washburn, of Canaan, makes his way down the Chocolate Slip ‘n Slide, at Yogi Bear’s Jellystone Park, at Yonderhill Campground, in Madison, on July 30. 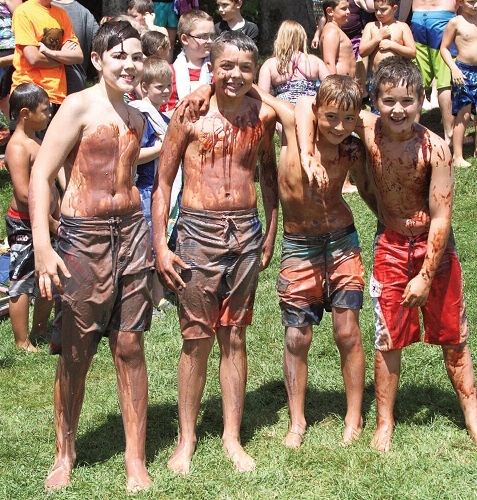 Right, from left to right, Riley Landry, of Vassalboro, Tate Jewell, Adam Fitzgerald and Landon Nunn, all of Skowhegan, get set to join in the slide.